Appalachian Mountain Roots: Appalachian Lore book review & giveaway! Since starting this blog, I've had the opportunity to get to know many different Appalachian authors, chefs, and fellow bloggers and that's all because of social media. I have discovered that the Appalachian warmth, welcome, and willingness to help is even present within the social media setting. I haven't once found a person who hasn't been willing to share what they have learned and along with that, an offer to help whenever I may need it...and in a world full of busy schedules and competitive attitudes, that's pretty special. One of these amazing people that I've met happens to be an Appalachian author by the name of Philip Kent Church. Philip is an Appalachian author, poet, and songwriter from Virginia. 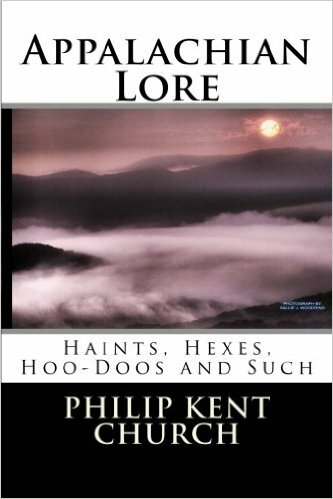 He recently sent me a signed copy of Appalachian Lore: Haints, Hexes, Hoo-Doos and Such to review and giveaway...right in time for Halloween! I've always loved a good goosebump inducing story and this book is full of them! Out of all of the stories mentioned, there are two that I enjoyed the most: "The Black Sisters" and "The Legend of Tom Dooley." The tale of "The Black Sisters" is a story about three spinster sisters from Christiansburg, Virginia who haunt a school building built on the grounds of a former all girls school where the sisters lived and served as administrators and teachers. The sister's deaths were followed with unexplained sounds, apparitions, lights being turned off, and even a rumored ritualistic murder. What makes the story even spookier is the first hand accounts of Philip himself! The other story I enjoyed was "The Legend of Tom Dooley." My dad used to play the famous song on his banjo when I was little and I found out that the song was based on a true story that happened in Wilkes County, NC. I honestly knew a good bit about this folklore because of previously doing my own research but found Philip's account of the story to be a good one. This story has everything a good one needs: love, betrayal, jealousy, and an unsolved murder! Tom Dooley (actually Dula but regional pronunciation has led people to commonly spell it as it was said) was a small town North Carolina boy who returned from war and met and started a relationship with a local girl, Laura Foster. This could have been a happy story had Tom not been having a relationship with Laura's married cousin, Anne Melton, also. Folklore has it that Laura became pregnant, and she and Tom decided to elope. The morning that Laura was to meet Tom (May 25, 1866), she quietly left her home and rode off on her father's horse never to be seen alive again. No one really knows what happened that day, but many believe that Anne learned of the couple's meeting and met Laura as she was on her way, murdered her, and then hid her body. Tom is said to have believed that Anne murdered Laura but loved Anne enough to take the blame which resulted in his execution. This giveaway will start today (10/17/16) and run until 7 pm on 10/24/16. I will be using an online random name selector to choose the winner and the winner will be announced over on the Appalachian Mountain Roots Facebook page on 10/25/16. If your name is chosen, you will have 2 days to submit your mailing information. If it isn't received by the deadline, a new winner will be notified. Best of luck to all of y'all!